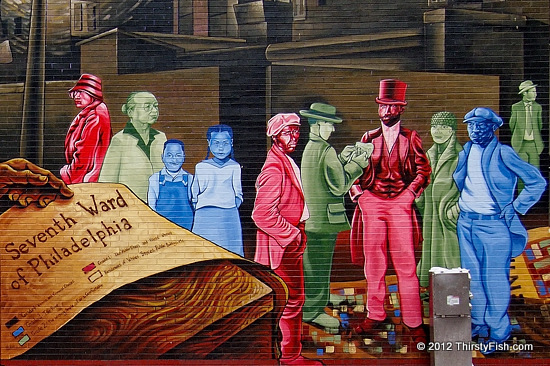 "Mapping Courage" is the last of the 17 murals on the Mural Mile. An influential writer, Du Bois fought racism all his life. He believed that capitalism was a primary cause of racism. He advocated for nuclear disarmament. He was against wars and remarked: "The cause of war is preparation for war". Due to his socialist leanings and his opposition to nuclear weapons, Du Bois was a target of the McCarthyism campaign. "Mapping Courage" stands on the wall of the PFD, Engine Company No. 11 building. Engine 11 is one of the original 22 professional fire companies reestablished in 1871. Until the Philadelphia Fire Department officially desegregated in 1952, Engine #11 was Philadelphia's de facto African American firehouse.